Whether he’s competing for a spot on the podium at a tournament in Hawaii or just riding the waves at Trestles, Nolan Senn loves to be in the surf line. 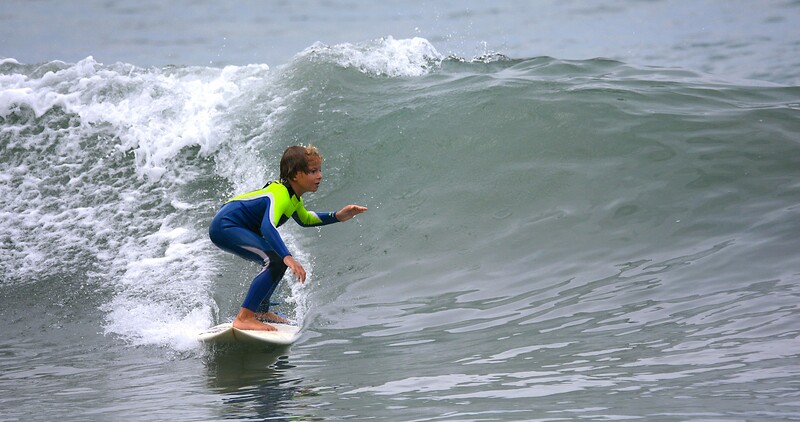 Nolan, 8, has been surfing since he was four years old. His father, Jason, is the coach and operator of the Endless Summer Surf Camp at San Onofre. “I started learning with my dad, and he’s been helping me work on turns and airs,” Nolan said. Last week he competed in a Huntington Beach tournament and placed fourth in his division at the Groms Rule competition at Ocean Festival on July 17. He also competed in the Town and County Surf (T&C) in Hawaii earlier this year. Nolan said his favorite part about surfing is learning and getting better at his technique. He has surfed in New Zealand, Marshall Islands, Mexico, Brazil and Costa Rica. Despite his passport being thoroughly stamped, he said his favorite spot to surf is still at his home break at Trestles with his friends. His primary goals for the future are to be invited to the World Surf League like his favorite surfer, Gabriel Medina. His mother, Elenice, said Nolan is very passionate about surfing, but he enjoys having fun with the sport more than he seeks to be competitive. Nolan’s parents were both professional surfers—Jason was on the San Clemente High School team and US National Surf team. Nolan competed in a few Western Surfing Association events last year, but this year Jason said he’s really starting to get into more competitions. Nolan splits his time between San Clemente and the North Shore of Oahu where the family lives half of the year. Endless Summer Surf Camp takes place through September 16.